For those of you who aren’t familiar with Washington, DC, that’s a view from the top of the Washington Monument looking westward, along the Reflecting Pool. towards the Lincoln Memorial; the photo was taken in 1943. There’s also this photo, showing even more buildings in the foreground, buildings that are actually sitting on the grounds of the Washington Monument. 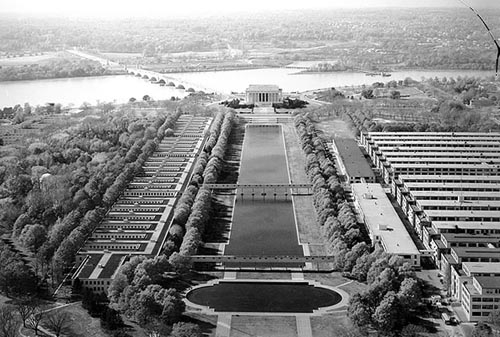 Today, none of those buildings you see along the sides of the Reflecting Pool are there, nor are the two bridges that actually cross the Reflecting Pool — the area is now taken up by the Constitution Gardens. The story of those buildings is a cool one — they were the home of the Department of the Navy (and a bunch of other Department of War offices) during the massive military expansion of World War II. All of those buildings were considered temporary construction with the mind that the occupants would move as soon as the war was over and suitable space could be found for permanent Navy digs, something that happened in 1943 with the completion of the Pentagon. Of course, they lived far beyond their original intended lives, but thankfully they were also built as temporary construction, meaning that after a while they started to surrender to the ages. When the mid-1960s brought crumbling foundations and bowing walls, President Nixon had the good sense to order them demolished and the land given back to the National Mall, returning to Pierre L’Enfant’s original vision for Washington, DC’s public space.